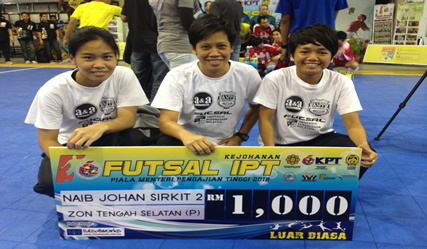 SUBANG, 29 April 2012 – The National University of Malaysia (UKM) women futsal team emerged as the first runner-up in the Higher Institution of Learning Futsal Championship 2012 for the Minister of Higher Education Trophy in the second circuit of the South Central Zone at the futsal feno here this evening. A total of 13 men’s teams from UKM; UiTM; USIM; UPM; UPNM; UPSI; UiTM Pahang; MMU; UMTech; UNIKL, MITEC Johor Bahru and the community colleges of Selangor, Negeri Sembilan and Kelantan and eight women’s team from UKM; UiTM; USIM; UPM; UPSI; UiTM Pahang; UTM and Politeknik MARA Kuala Lumpur took part in the four day championship organised by the International Islamic University (IIU). Teams from UiTM won both the men and women’s event held for four days here. The Selangor Community College was the runner-up in the men’s category with University of Management and Technology the second runner-up while the team from UPM won third placing in the women’s event. UTM student Joponimilina anak Lisan was judged as the best woman player with Muhammad Afif Asyraf Mohd Zawawi from UiTM the best male player. Deputy Vice Chancellor, Students, Alumni and Management Affairs of UNITEN who is also the Chairman of the IPTS Sports Council, Prof Ir Dr Kamal Nasharuddin Mustapha; Deputy Vice Chancellor Students and Alumni Affairs of UKM, Prof Ir Dr Othman A. Karim; Secretary of Sports Division of the Ministry of Higher Education, Dr Saharuddin Hj Ismail; Director of UKM Sports Centre, Dr Tajul Arifin Muhamad and Director of Sports and Recreation Centre of IIU who is also the Manager of the Championship, Noorkefli Md. Sulong were present at the prize giving ceremony.